Talk to the receptionist, then go through the door to the northwest. The first room north of here has a Latte, sitting on the desk in the middle of the room. - Return to the hallway. To your left is another office where the Bodybuilder waits, along with lots of chances for experience via exploration. That done, head upstairs to the north, and make your way to the President’s office. Chat with him to get your next mission - grab coffee from Moonbucks! - and talk to the Secretary for the Secretary Recruitment quest. - Back outside. You’ll find the local Moonbucks to the southeast of the Capitol Building, along the northern edge of the next screen to the south. Inside you’ll find a Cappuchinerd who will refuse to give you coffee. (Make sure you talk to him before you take him down.) This place is a dead end, so head outside. You’ll come under attack by two Not-So-Secret-Services; these guys shouldn’t give you much trouble. - From this point Capital City will be filled with baddies, namely Mini-Missiles (fired from those massive tanks, which you actually can’t fight) and more Not-So-Secret-Services. Fight your way back to the Capitol Building by heading east through Capital City, then using side streets to skim around the barricades to reach the west side of the Capitol Building. Here you can access the parking garage. 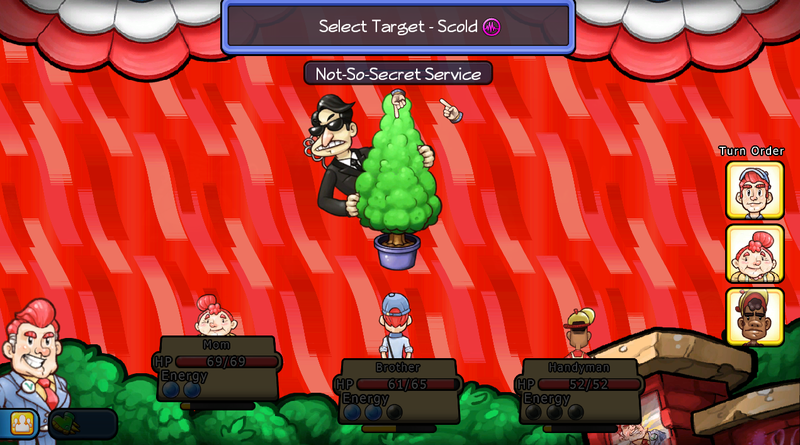 A Not-So-Secret Agent attacks the party. That name is pure truth. - The garage leads east. Head south at the first turn and you’ll find a slew of parking spots guarded by patrolling tanks. Head south through the parking lot to find stairs. These lead to a library. Check the shelves for experience, and look on the left side of the room for Ointment for the Pharmacist. - Head back into the parking garage and return to the eastbound stretch of road. Follow the first stretch of the parking garage east it until you reach a parking lot patrolled by Tiny Tanks. Head north from here (even though it looks like a wall there’s a doorway beside the flagpole in the north) and follow the path beyond until you can get into the fenced area to your right. Head north and you’ll find $500 amid some alien-esque cylinders. - Head back south and take a right. 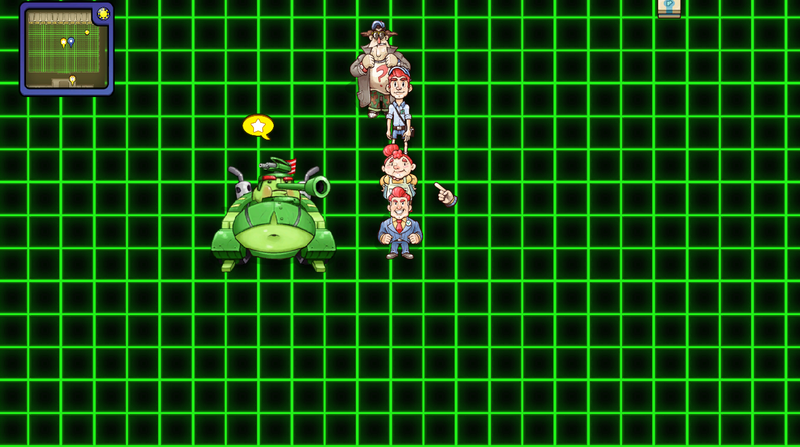 You’ll find a gridded area with a tank to whom you can speak. Check up and to the right of the tank to find a Bomber Jacket for the Pilot, then speak to the tank to learn that it is the Security Chief. This triggers Permission: Impossible. - Head back to the main parking lot and go southeast, past the patrolling Tiny Tanks. You’ll find a path leading upstairs. In the first room you’ll come across your first Toupee Eagle. They’re as easy as everything else in here, though they can distract your team pretty badly if left to act. - Head into the western hallway, then go south. There’s a Dynamite Roll on a table in the office on your right, and there’s a Bun in the top-right corner. Leave the room afterward and head north through the hallway until you reach an intersection. Take a right, then check the northern room for experience via a filing cabinet on the right. Then return to the hallway and go up the stairs on your right. - There are four doors here, each containing a Toupee Eagle. They will provide you with a series of coloured forms, as well as hints as to which form needs to be filled out before which. Return to the Security Chief after speaking to all four Toupee Eagles and turn in the forms in this order: red, green, purple, and yellow. This will satisfy the Chief… fooooor about five seconds. Tankenstein, the head of security at the Capitol Building. Easy fight. Tankenstein’s primary offensive tactic is to spit out Mini-Missiles which will join the fight and deal out a significant amount of pain. This would be problematic if Tankenstein took one turn to shoot them out, or if the Missiles had more than a paltry amount of HP. Fortunately, neither is true. 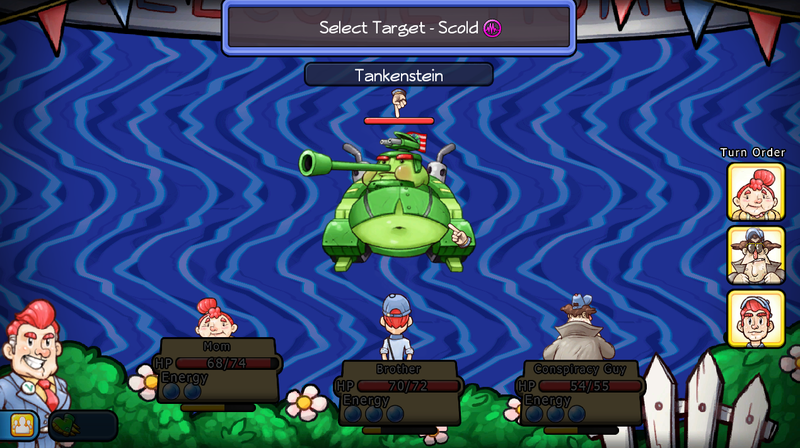 Smack down any Missiles spit out, then focus your firepower on Tankenstein for a relatively easy kill. - Once Tankenstein is down the door to the lobby of the Capitol Building will unlock. Climb back to the first floor intersection and take a left from the Secretary’s office to get back to the lobby. Take out the Toupee Eagle at the front desk, then go through the left door. Go west through these hallways, check the tables along the way for a Donut, and go up the stairs at the end of the western hall. - Second floor. Check the office to the northeast and you’ll find Evidence About the Opposition Leader on the desk in here, part of the Dirty Politics quest. Check the rear room for a Cappuccino while you’re in here. The Puppet President and the Seat of Power. Not much to say here. 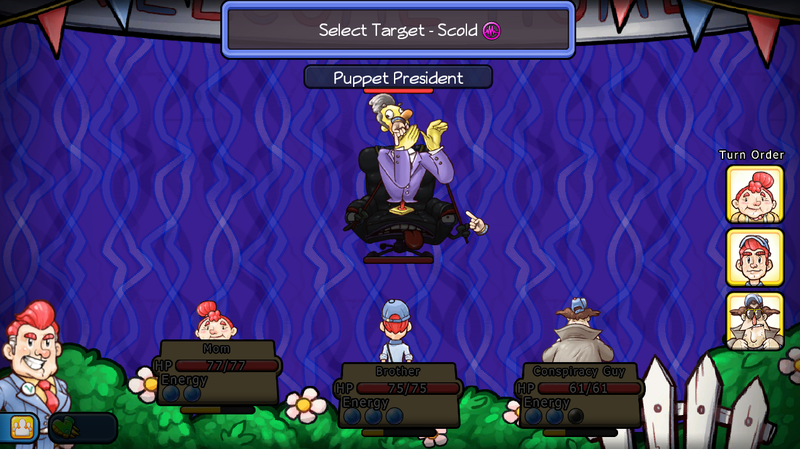 The Seat of Power will use the Puppet President to smack you around, potentially earning you multiple hits per turn. Stop this by quickly wiping out the Puppet President (easy), then turn your full attention to the Seat of Power itself (also easy). Take down both to end the fight. 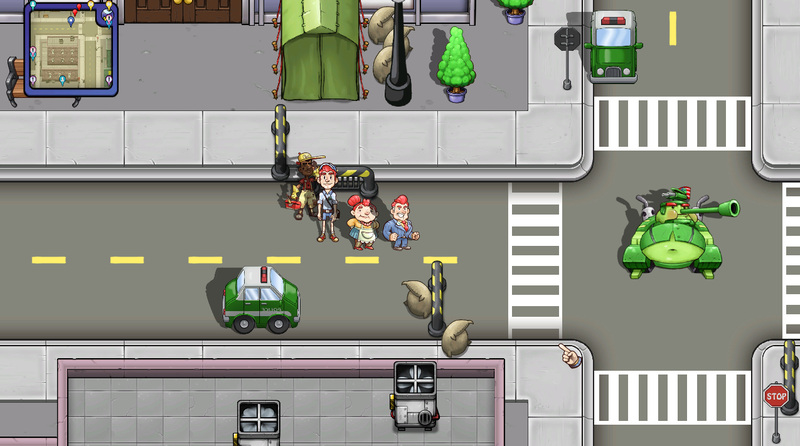 You’ll earn a Police Scanner for Conspiracy Guy for defeating this oddball duo. - Head downstairs after taking out the Puppet President and talk to your Secretary. He’s in a room on the east side of the Capitol Building that was previously locked, and he’ll give you three quests to complete, though you only need to finish one. He also triggers Chapter III, all official-like. Yay! - There’s a busted door in a room on the west side of the Capitol Building’s first floor. (Look for blue wallpaper.) A Rank 3 Handyman can get you inside.